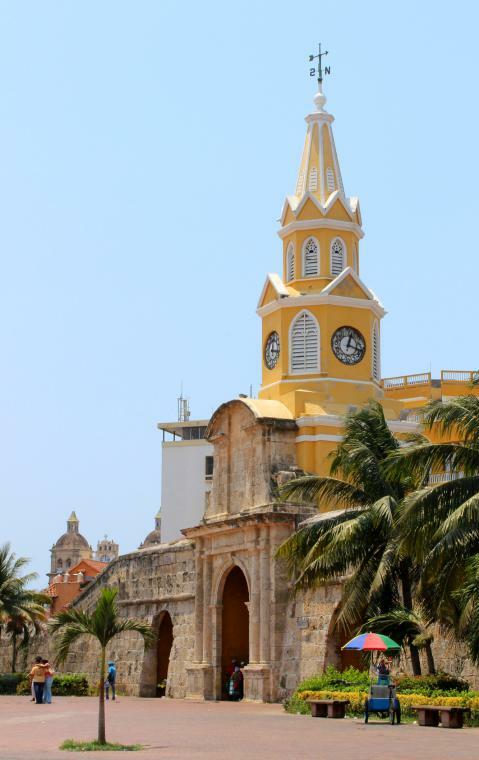 If you can only choose one place to go in all of Colombia, make it Cartagena. Located on the Caribbean coast, this incredible city feels as relaxing as an all-inclusive resort, with the added perks of having historical landmarks, fun nightlife and all the amenities found in a big city. The minute you get off the plane you’re hit with a wave of humid, tropical air, before making your way into the terminal where you’re surrounded by ads for the beach resorts the area is famous for. A quick taxi ride whisks you past countless sandy beaches being pounded by waves, before arriving in the historic centre or Bocagrande, where many of the luxe, high-rise hotels are. While there’s always something going on in Cartagena, the city is surprisingly laid-back and very safe. Whether you love the beach or are a history buff, there’s truly something for everyone. Cartagena’s old town is an absolute treasure. Full of vibrant colonial buildings which are perfectly maintained, the historic centre is like a little piece of Europe with its winding, narrow cobblestone streets. Lush greenery and bright pink flowers cascade over the intricate railings decorating each window, and the whole area is surrounded by old stone walls which were built back in the 1500s to protect the city. The city centre takes up dozens of city blocks, but there is no better way to explore it than on foot. Simply wandering around means you’ll stumble across landmarks like the Gertrudis sculpture (basically a naked woman), or you can book a walking tour with a local guide. A great place to start off is at the Clock Tower (Torre del Raloj Publico) which is considered the entryway into the city—and a great landmark if you get lost. It leads into Peace Plaza (Plaza de La Paz) which has a number of restaurants and shops, then branches off into the side streets. Naval Museum– Holds models and exhibits highlighting Cartagena’s military past—great for history buffs! Palace of the Inquisition– This is where sentences were handed out during the inquisition, and can be found across from Bolivar Park. Museo del Oro– This gold museum is free of charge, and has two floors full of pieces including ceramics and goldsmithing. San Pedro Claver Temple– A stunning historic building located in equally beautiful San Pedro Plaza, the monument features a cupola which can be seen across the entire city. The 11 kilometres of stone walls surrounding the centre are also an attraction in themselves, and if you climb up to the lookout points you can see both the ocean and centro historico at the same time. If you venture toward them from the outside, you’ll notice there are cutouts in the wall, which are a popular spot for people seeking some shade. Regardless of where you end up, make sure you don’t miss Bolivar Plaza, a beautiful, leafy green park that provides a nice respite from the blazing Caribbean sun. A number of important buildings are also just steps away, so it can also be a good spot to start your tour. The plaza is stunning in the evening, when the low light highlights the fountains. Grab a drink during happy hour at one of the second-storey restaurants that looks down on it, or hop in a horse-drawn carriage for the ultimate romantic night out. Top tip: Start touring old town early in the morning (9-9:30 a.m.) as there are not many people on the streets and you’ll get the run of the place. It’s also not as hot! A fountain in Bolivar Plaza. For a taste of Cartagena’s glitz and glam, head to Bocagrande—or better yet, stay there. The area is simply exploding with development, resulting in a sea of bright white high-rises holding hotels, resorts, upscale condos and shopping malls. Not only are they just steps away from the beach, but they also afford incredible views of the city. I stayed at the Hampton by Hilton Cartagena, which has a beautiful rooftop pool that offered a great way to soak up the sun without being bothered by vendors or wind-whipped sand on the public beach. Even if you’re more of a poolside person, it’s worth heading out to the beach for at least an afternoon. While the brown sand and murky water isn’t great for photos, the beaches are clean and the surf is surprisingly warm—great for swimming, especially if you like navigating the crashing waves. Visitors can rent a beach chairs flanked by a little tent to keep the sun away, or grab a Pina Colada at one of the many small bars that line the strip. After a day of relaxing, head out for a walk along the main avenue in Bocagrande, called Carrera 2da (or Avenida San Martin). This is where you’ll find clothing boutiques, souvenir shops, casinos, grocery stores, cafes, dozens of restaurants and fast food chains. If you’re lucky you might even stumble across a group of dancers or musicians performing on the side of the road! A popular pick for those heading to Cartagena is to make the trek over to Castillo de San Felipe, which is a fortress perched on top of San Lazaro hill—perfect for keeping an eye out for enemies. Fortunately the city is no longer a target for foreign takeovers, so the fort is now open to visitors who want to check out its dimly-lit bunkers and maze of tunnels. There are also great views of the city from the top lookout point. As it’s situated away from the main tourist areas, either take a cab to Castillo de San Felipe, or brave the half-hour walk from the historic centre. Admission is about $8 for adults. Another way to get a tour of the city is to hop on a chiva. A chiva is a brightly decorated bus tricked out with neon lights, which roams around Cartagena. The best time to jump on is at night, when it turns into a party bus. The cheap rum flows without abandon, as the chivas zoom around the city accompanied by the delighted cheers of the drunk partiers on board. Tickets for the night tour are about $17 per person including unlimited drinks, and can be purchased from any tour operator around town. Chivas are used as a tour bus during the day, and a party bus at night. While South America is traditionally budget-friendly when it comes to food, that’s not the case in Cartagena. As it’s such a tourist hot spot, restaurants can get away with charging much more, so expect to spend at least $10 on an entrée and $5 per drink (excluding beer which is about $1), especially in the centro historico. That being said, there can be deals if you know where to look. One of my best finds in the old town was a stand selling fresh-squeezed, sweet tangerine juice for about $1 per glass, along with patacons for $2 each. Patacons are amazing! They’re basically a taco wrapped in a plantain, and the inside is stuffed with meat, cheese and salsa. They’re filling, delicious, and cheap! As a bonus, the stand was right in front of a Juan Valdez café, which is a MUST as Colombian coffee is world famous. Juan Valdez is basically Colombia’s answer to Starbucks (or Tim Hortons, for you Canadians), but—dare I say—is even better. Be sure to stop in for a coffee to start the day, or grab one of their frozen ice coffees if you need to cool off in the afternoon. Getting around: Cartagena is surprisingly walkable, and major sites are all within 30 minutes of each other. However, taxis are also plentiful and cheap, so this is the more popular option (especially when it’s blazing hot outside!). They’re safe, and we never had a single driver try to overcharge us. Expect to spend 6,000 pesos to get from Bocagrande to old town (about a five minute drive) and 17,000 pesos from Bocagrande to the airport. Tipping: Tax and service charges are usually included on restaurant bills, and cab drivers also don’t expect tips. However, it’s nice to leave a bit extra if you had good service, as they’ll always appreciate it. Must do: Hit the town for a night of salsa dancing! Colombians are famous for their hip-shaking, and there are lots of spots around town with a lively dance floor. No worries if you don’t know the moves: just do a drop-in dance class, then show off what you learned! Those little cutouts in the wall were the best for a little mid-afternoon rest from the sun. Felt like a private hideaway! That pocket of deliciousness looked amazing! Cartagena is at the top of my travel list. Awesome! Such a great city!